We are pleased to inform you that the registration for CRE 2018 is now open! 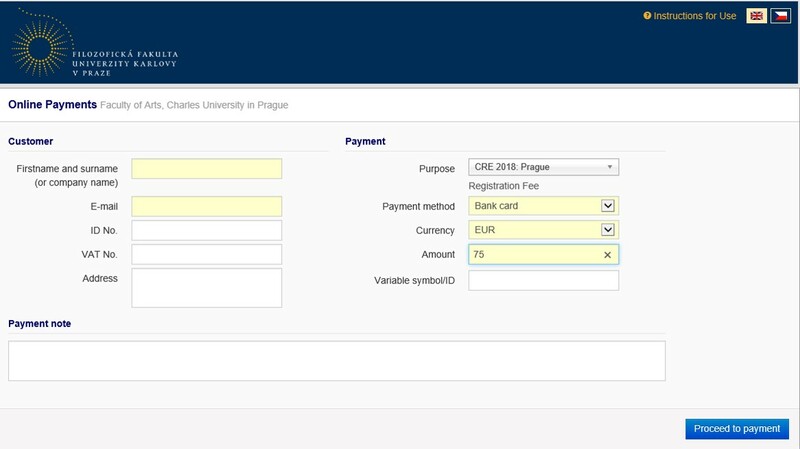 You now can download a REGISTRATION FORM (which has to be submitted together with the payment): cre_2018_prague_registration_form. During the registration period, you also have the opportunity to book for the three-course conference dinner on Tuesday, June 26 th (€25). The cost for the conference dinner is NOT included in the registration fee and needs to be added on top of the costs of the registration fee. All participants must register by June 1 st 2018, at the very latest. The dinner and sightseeing tour need to be booked by the same date. b) Bank transfer. Please be advised that this option will be (much) more expensive. 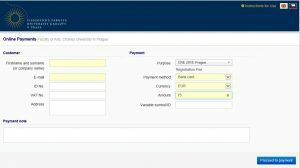 CRE 2018 Prague into the Payment Note. presentation and if you want to book the dinner). Unfortunately, due to the tax system of the Czech Republic, it will be impossible to pay the registration fee in cash during the conference. We also offer you a possibility to arrange some affordable accommodation (€12–20 per person/day depending on the capacities and number of the accommodated persons) at the dormitories of Charles University (https://kam.cuni.cz/KAMEN-123.html). If you are interested, please let us know via email until March 31 th 2018.